Five hundred years ago Michelangelo began work on a painting that became one of the most famous pieces of art in the world—the Sistine Chapel ceiling. Every year millions of people come to see Michelangelo’s Sistine ceiling, which is the largest fresco painting on earth in the holiest of Christianity’s chapels; yet there is not one single Christian image in this vast, magnificent artwork. 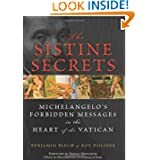 The Sistine Secrets tells the fascinating story of how Michelangelo embedded messages of brotherhood, tolerance, and freethinking in his painting to encourage “fellow travelers” to challenge the repressive Roman Catholic Church of his time. Every year more than four million visitors from all over the world throng to the Vatican Museums, the most-visited museum complex on earth. They come for one overriding reason – to see the Sistine Chapel, the holiest chapel in the Christian world. Viewers – Christians, Jews, Moslems, atheists, art lovers and the merely curious – are moved not only to marvel at its aesthetic beauty but to be inspired by its history and its spiritual teachings. The major attraction, without a doubt, is the incomparable vista of frescoes on its ceiling and its altar wall, the work of Michelangelo Buonarroti, universally acknowledged as one of mankind’s greatest artists. But how many of the millions of awestruck spectators who enter the Sistine know that the Pope’s own chapel, built in the heart of the Vatican, is a full size copy of the Holy of Holies in Solomon’s ancient Temple in Jerusalem?…. And how amazed would they be to discover that Michelangelo himself embedded secret messages inside the Chapel?…. What if this message went unheeded and then was lost for five centuries? What if it were to be rediscovered and deciphered today? And what if this were not a piece of speculative fiction, but completely, amazingly, true? This is the startling and provocative thesis that The Sistine Secrets will for the first time reveal – and convincingly prove. It will demonstrate how Michelangelo incorporated into his religious masterpiece a stunning number of hidden messages to the Church of his time, messages that resonate to this day with their daring appeal for reconciliation between reason and faith, between the Hebrew Bible and the New Testament, and between all those who share a sincere quest for true faith and service of G-d.